Royal Greenwich Heritage Trust are displaying a small archival collection of LGBTQ+ memorabilia from local charities at Charlton House this month. On display in the Tea Room throughout February this mini exhibition includes items such as postcards from LGBTQ campaigns, through to sharing information on HIV prevention. Pamphlets and magazines with information and services available to LGBT people in Greenwich, as well as significant changes to civil and criminal law in the fight for equality for LGBTQ+ people are also on display. Two t-shirts can be seen from Pride Marches, one in 2005 and the other unknown, both from Metro charity a leading equality and diversity charity providing health, community and youth services across London and the South East. There are also postcards and other ephemera, also from Metro charity, including a cartoon sketch discussing the inclusion of Trans people in LGBT history. Producer and Community Engagement Officer Helen Young said “The Trust is currently on a collection freeze while we work through a back-log of documentation and collection move, but we are delighted to bring this mini exhibition to the local community and hope to begin collecting oral histories and other ephemera from the LGBTQ+ community in the very near future”. Charlton House is managed by Royal Greenwich Heritage Trust. Photo by Neil Clasper. I would like to update you on the work of the Royal Greenwich Heritage Trust (RGHT) which has been busy managing and developing their significant portfolio of Royal Borough of Greenwich heritage assets. Much has taken place at the Trust over the last few month, and residents will be aware that Greenwich Heritage Centre i Woolwich closed its doors on 21 July to make way for Phase I of the Creative District development. A new facility is in development with the Royal Borough of Greenwich with public access to a new Research Room. The Greenwich Archive Users Forum has been established and RGHT are working with the Forum to ensure access to the borough’s archive collections continues and can be enjoyed by many more residents in our community in the future. The Museum & Archive team are now based at Charlton House. Pauline Watson, the archivist, has continued to deal with enquiries from the public by email and telephone since the closure of the Heritage Centre, and is looking forward to working with researchers in person again as soon as the new facility is up and running. At the moment she is carrying out some incredibly useful research into past repairs and maintenance of Charlton House since the 1920s, the Trust will be sharing some of its findings on its blog in the coming weeks. RGHT is providing the ‘Hub’ at Charlton House for a new project, Layers of London. Launched at an event last week, the project, funded by the Heritage Lottery Fund in partnership with London Metropolitan Archive and University of London, aims to work with the community to record layers of ‘London’s rich past’. The first meeting at Charlton House saw a wide attendance, not only from the Charlton and wider Greenwich communities but from interested people across the south east. Some very interesting projects were shared at the meeting and anyone can take part by adding their story to the site. RGHT looks forward to seeing the content grow over the next two years as the project develops. The ‘Making Woolwich’ exhibition, from the Heritage Centre is the focus of the teams work now as they manage the redesign and relocation of the display to Woolwich Town Hall. This exhibition opened in December 2016 to celebrate the 300-year history of the Royal Artillery. Elements of this story will transfer to the Town Hall in November where new audiences can find out about the important story of the Royal Artillery in Woolwich and the men and women who have served in the Borough over the last 300 years. The rest of the Museum & Archive collections will not be mothballed during this period of closure. The Trust team will take this opportunity to develop a programme of exhibitions and events that will see the collections travel out into the community. The war memorial in Charlton. 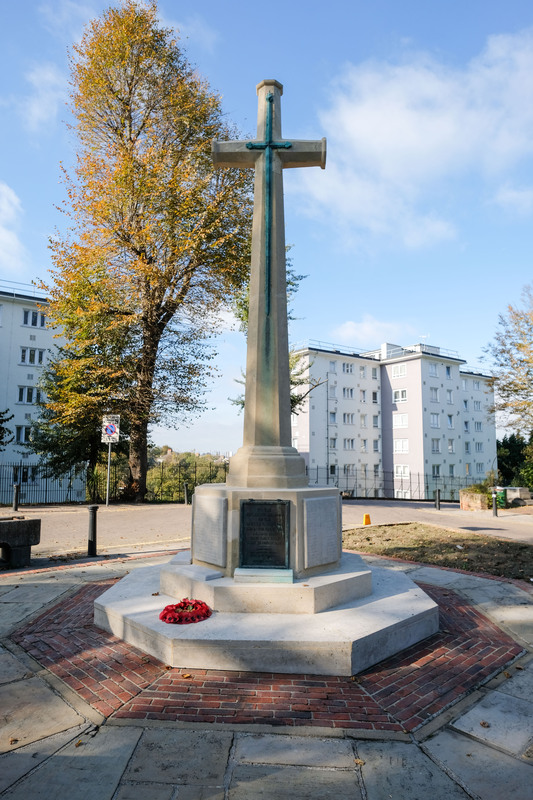 The borough’s war memorials are maintained by Royal Greenwich Heritage Trust. Photo by Neil Clasper. As the centenary of the end of the First World War approaches RGHT has 4 Tommies’ from the There but not There project. If community groups are interested in loaning a Tommy for an event they can contact Edward@rght.org.uk for details. You can find out more about the First World War Victoria Cross recipients of the borough on the RGHT blog where each week the story of one of the four local heroes will be revisited. The new RGHT What’s On leaflet is now available. You can pick up a copy at Charlton House. You can also collect a copy of the Woolwich History Walk leaflet, designed and printed with a generous grant from the Ministry of Defence Community Covenant Fund. If you can’t drop into Charlton House, you can download the leaflet here www.greenwichheritage.org/visit/woolwich-history-walks. Alternatively, if you would like to take part in the walk or would like copies of either the adult or family version for your group please contact office@rght.org.uk and copies can be sent to you for display. I will publish a further report early in 2019. Open House Weekend 2018: What can we visit in Charlton and nearby? 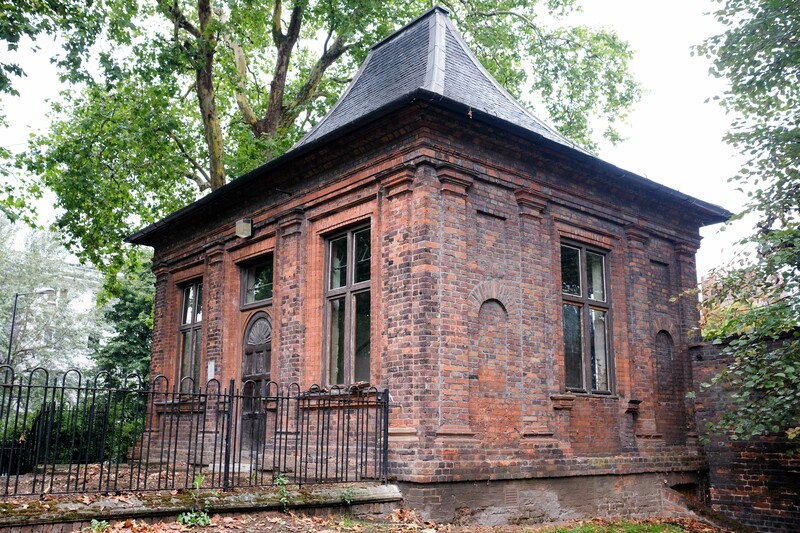 Charlton House’s Summer House, currently undergoing restoration works, will be open to visitors as part of this year’s Open House Weekend. Many thanks to Charlton Champion contributor LARA RUFFLE COLES for this round-up of the properties in Charlton and nearby that are taking part in this year’s Open House Weekend. Open House is a tricky beast… there is always so much to see over the two days, and as the event increases in popularity each year, balancing visiting many buildings versus visiting the popular ones gets harder and harder – let alone navigating your way round London. So, how about you just stick to the Royal Borough of Greenwich this year? It is definitely worth focusing on a smaller area and is something the other half and I did one year – and we’ve been ‘Open House-ing’ since 2009. This year’s event takes place on Saturday 22nd and Sunday 23rd of September, and Greenwich borough alone has 23 buildings to visit and 3 tours to consider. As it can all be a bit overwhelming, here is a Top Five ‘must have’ list, plus a few more if time allows. An obvious but excellent choice. 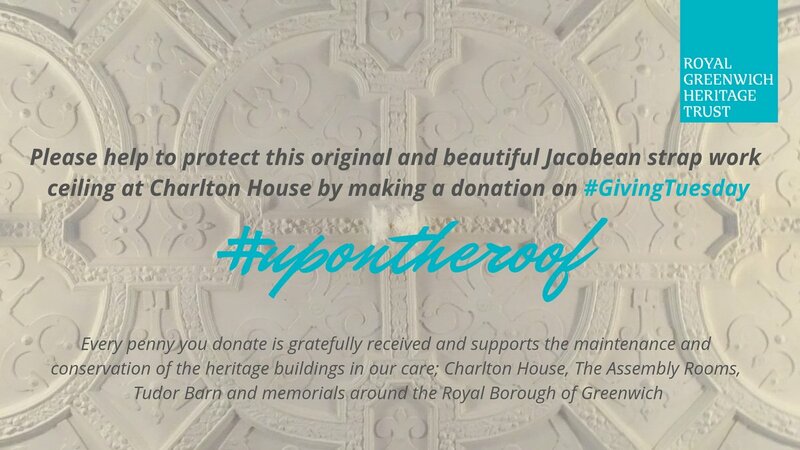 Our local community centre is London’s only surviving Jacobean mansion, and a superb venue to get married in. Visit rooms that are usually off limits during regular opening hours, and gaze lovingly at our local park through the upstairs windows. This year you’ll be able to take a look around the Summer House, currently undergoing an extensive refurbishment. I’ve not been to this location but having visited other homes in Greenwich and further afield, a good nosy round someone else’s house is well worth your time (and it is the only house listed for Greenwich borough this year). This 1960s building is also the architect’s home so you can ask all the questions you like – whether your interest is the building itself or its interior design. This graceful foot and cycle bridge between Deptford and Greenwich was opened in 2015 and spans over Deptford Creek. Visiting at low or high tide is an exciting prospect, and if you are really lucky you might see it open and close – please note we have no information on when this might happen! A hidden gem at the top of Shooters Hill, this tiny 18th century tower reopened to the public a few years ago. The views from the roof are magnificent and you can also hire the castle for various events including weddings. Built in 1903, our borough’s Edwardian town hall has an absolutely stunning main hall with bifurcated stairs. The entrance itself, the clockhouse and the exterior are also worth a good look at. And you can definitely get married here – as I did in 2014! I’ve not been inside the yacht club, but viewing the building, the walkway to it and the surrounding Thames views make the trip there worthwhile. The area itself is also part of the Thames Path. Across from Woolwich Barracks, the bombed-out St George’s Garrison Church is well worth a pootle about. Lovely brickwork, mosaics that have been recently restored, and a new arched roof to protect the ruins from further damage. The Sunday of Open House Weekend would be a good time to visit this entry as the Environment Agency will be carrying out the Barrier’s annual full tidal closure test, with “various fun and educational activities for children, talks, demonstrations, information and display stands”. There’s a permanent playground here with a big slide for the child in all of us – and the slide itself is built on top of the levee that protects the surrounding area from flooding. Don’t forget to order your guide to plan the weekend in advance. You can use the Open House site to read up on every listing, but having the actual book to carry about is essential. Order ASAP as delivery will be a few days. If you aren’t keen on carrying an A5 book about, you can download the Apple and Google apps, but please do buy the guide for £10 and help support this amazing event. Did you know that Open House takes places in other cities? 42 participants as of this year, read more at Open House Worldwide. Have you got an Open House Weekend recommendation? Let us know in the comments below!